1979-01-07. New. Ships with Tracking Number! INTERNATIONAL WORLDWIDE Shipping available. Buy with confidence, excellent customer service! Wiley. Hardcover. 0470458364 New Textbook, Ships with Emailed Tracking from USA . New. 2011-05-02. New. Ships with Tracking Number! INTERNATIONAL WORLDWIDE Shipping available. Buy with confidence, excellent customer service! Wiley. Hardcover. 0471488852 New Textbook, Ships with Emailed Tracking from USA . New. 2005-11-11. New. Ships with Tracking Number! INTERNATIONAL WORLDWIDE Shipping available. Buy with confidence, excellent customer service! 2006-06-08. New. Ships with Tracking Number! INTERNATIONAL WORLDWIDE Shipping available. Buy with confidence, excellent customer service! Wiley, 2011-08-16. 10. Hardcover. Used:Good. 1999-05-04. New. Ships with Tracking Number! INTERNATIONAL WORLDWIDE Shipping available. Buy with confidence, excellent customer service! 2011-08-05. New. Ships with Tracking Number! INTERNATIONAL WORLDWIDE Shipping available. Buy with confidence, excellent customer service! Wiley, 2005-11-11. 9. Hardcover. Used:Good. Wiley. Hardcover. 0470458364 Like New Condition. . Fine. Wiley. Hardcover. 0470458364 New Condition. . New. 1972-02-07. New. Ships with Tracking Number! INTERNATIONAL WORLDWIDE Shipping available. Buy with confidence, excellent customer service! 2011-05-02. Good. Ships with Tracking Number! INTERNATIONAL WORLDWIDE Shipping available. May not contain Access Codes or Supplements. May be ex-library. Shipping & Handling by region. Buy with confidence, excellent customer service! 1992-08-08. Good. Ships with Tracking Number! INTERNATIONAL WORLDWIDE Shipping available. May not contain Access Codes or Supplements. May be ex-library. Shipping & Handling by region. Buy with confidence, excellent customer service! Wiley India Pvt Ltd, 2011-01-01. Paperback. Good. Wiley. Hardcover. 0470458364 US Edition Textbook, May Have Highlights, Notes and/or Underlining, BOOK ONLY-NO ACCESS CODE, NO CD, Ships with Emailed Tracking from USA . Good. Wiley. Hardcover. 0470458364 Item in good condition. Textbooks may not include supplemental items i.e. CDs, access codes etc... . Good. John Wiley & Sons. PAPERBACK. 0471728977 Item in very good condition! Textbooks may not include supplemental items i.e. CDs, access codes etc... . Very Good. John Wiley & Sons Ltd, 2011-05-03. Paperback. Good. Wiley, 2011-08-16. Hardcover. Good. This is an international edition textbook (same content, just cheaper!!). Book in 'Good' Condition and will show signs of use, and may contain writing, underlining, &/or highlighting within. May not contain supplementary materials. Second day shipping available. Ships same or next day.This is the U.S. student edition as pictured unless otherwise stated. 1993-04-08. Good. Ships with Tracking Number! INTERNATIONAL WORLDWIDE Shipping available. May not contain Access Codes or Supplements. May be ex-library. Shipping & Handling by region. Buy with confidence, excellent customer service! 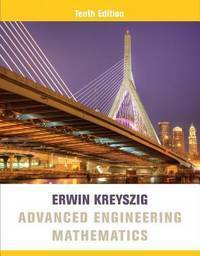 Erwin Kreyszig - Advanced Engineering Mathematics - Paperback. Book. BRAND NEW. John Wiley & Sons Ltd. PAPERBACK. 0470646136 Brand new book. Ship from multiple locations. 3-5 business days Express Delivery to USA/UK/Europe/Asia/Worldwide. Tracking number will be provided. Satisfaction guaranteed. . New. John Wiley & Sons Inc. Used - Acceptable. 9781770664623 The book is a readable copy showing signs of wear and the pages are intact. The cover may have some creases or minor tears. The dust jacket (if applicable) may be missing. The book may be an ex-library book. The book may contain: a publisher remainder mar some highlighting All orders guaranteed and ship within 24 hours. Your purchase supports More Than Words, a nonprofit job training program for youth, empowering youth to take charge of their lives by taking charge of a business. Seller: More Than Words Inc.
John Wiley, 2003. Paperback. VeryGood. . Slight edge wear due to storage. John Wiley & Sons, 1972-07-12. 3rd. Hardcover. Used:Good. 2005-11-11. Good. Ships with Tracking Number! INTERNATIONAL WORLDWIDE Shipping available. May not contain Access Codes or Supplements. May be ex-library. Shipping & Handling by region. Buy with confidence, excellent customer service! 1988-04-30. Good. Ships with Tracking Number! INTERNATIONAL WORLDWIDE Shipping available. May not contain Access Codes or Supplements. May be ex-library. Shipping & Handling by region. Buy with confidence, excellent customer service! John Wiley & Sons Inc, 1983. This is an ex-library book and may have the usual library/used-book markings inside.This book has hardback covers. In poor condition, suitable as a reading copy. John Wiley & Sons Ltd. PAPERBACK. 0470646136 Brand New ,Original Book , Direct from Source , Express 5-8 Business days worldwide Delivery. . New. John Wiley & Sons, 2007-08-21. Hardcover. Good. John Wiley and Sons Publishing-, 1972. Hardcover/pub.1972/Gd. condition/866 pages - Engineering and physics..(KR91234z). Hard Cover. Good. John Wiley & Sons Inc, 1983-05-01. 5th Revised edition. Good.